~The Colony Theatre • 555 North Third Street • Burbank, CA 91502 | directions/venue info. A fast-paced, professionally directed comedic showcase of 42 carefully screened and appropriately cast actors in about 75 minutes. Did we mention that we’ve chosen a location where free parking is a breeze? And that we’re rolling out yummy munchies and adult beverages before and after the show? Awesome, right? Yeah. We thought so too. 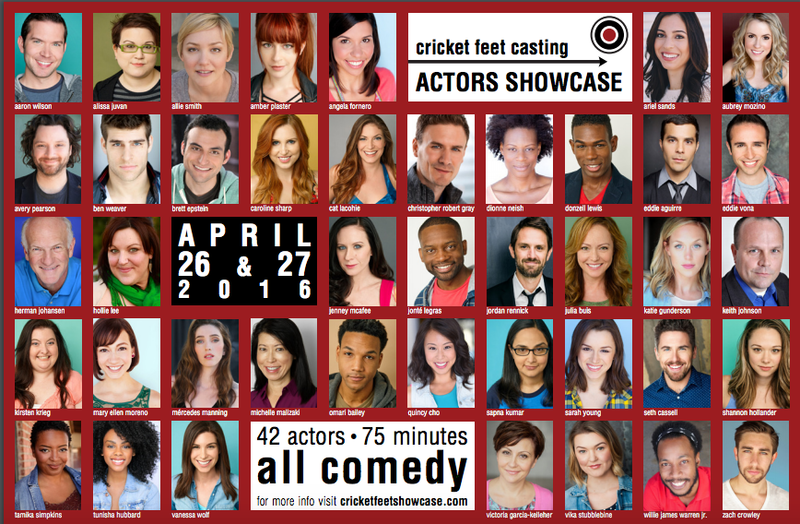 Cricket Feet Casting is a company run by Bonnie Gillespie, indie casting director, Television Academy member, and author of Self-Management for Actors. Director Matt Chaffee co-founded and served as the artistic director for the Subtle Bliss Theatre Company in Hollywood for eight years. During his tenure, he oversaw 23 productions, including his own personal venture–the award-winning Fluffy Bunnies in a Field of Daisies–which closed as the longest running comedy in Los Angeles history to date and won Best of Festival honors at the New York Fringe Festival.